Please view some fun pictures by category (click on the little arrow next to the word Gift Card Boxes in the navigation on the left) to see a variety of styles and to get ideas to jump start an idea for your gift card box. But in the meantime, if you have any questions, hopefully I have an answer for you here. Q: What size are the boxes? 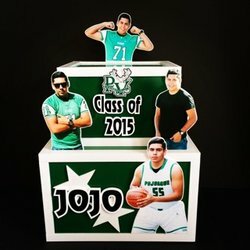 A: Most bottom boxes are 17" x 12" x 12" but that size can vary by a few inches based on the designs and photos being used. This is a generous size to hold over 100 cards because they fall flat and stack on the bottom. Q: What are made from? A: Foamcore that is about ¼" thick. Q: How do I get the cards out without damaging the box? A: There is a trap door on the bottom. A: 2 levels average $150. One simple level with a name and one design can be $85. Multiple level boxes average $165 and up. Q: How much lead time do you need to order one? A: That depends on how full our schedule gets. Some months are lighter and we can do one in a couple of weeks. Sometimes it can take up to a month. Q: What is the process to order one? A: The first step is to send me an email with your ideas and the date you need it. Then I would design something up on the computer with your colors and photos and other design elements based on your budget. You can tweak that design however you'd like. You would send payment and we make it and ship it. Q: Can I add items to the sides as well as the front? A: Yes. But the main focus is the front. Q: How can I re-purpose it after the party? A: It can store party memorabilia inside. Q: What is the shipping time and cost?